The simple things in life are often the best, and this spinach and lentil dish is just that. Spring being the best month for fresh spinach in the UK where it is most easily obtainable, this dish is an ideal way to cook this vegetable fast and make the most of its bitter flavour. Cooked with puy lentils and served with white fish, makes for a high-protein, low-fat dish that we admit may not look the most glamorous will certainly leave you feeling satisfied. 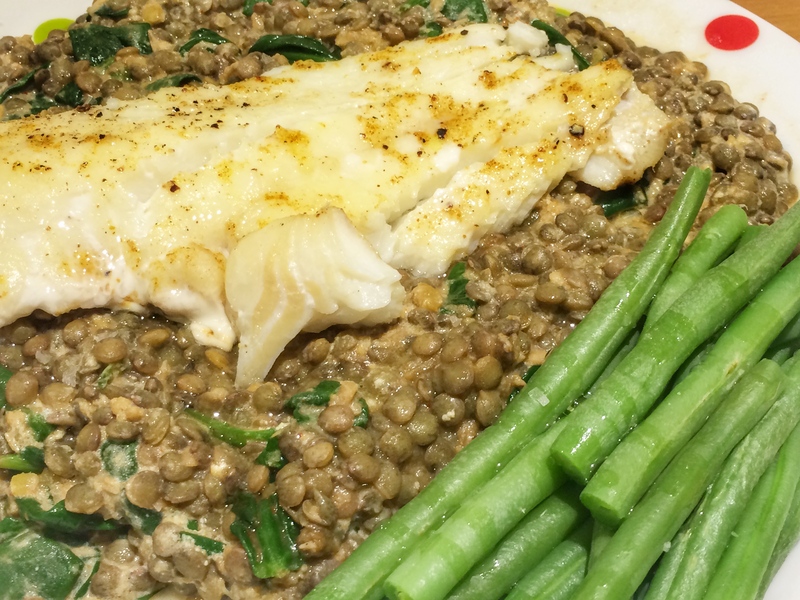 This recipe for spinach and lentils with baked cod is perfect as a mid-week meal as it can be made from scratch in just over 20 minutes. Whilst we used cod, you are of course free to use any white fish you choose. To boost the dish even more, fry some pancetta in the saucepan before add the spinach, spices and lentils for extra flavour. Pre-heat your oven to 180ºC, fill the kettle and put on to boil. Place the 2 fillets of fish in an oven-proof dish. Drizzle with a little olive oil and then season with salt, a modest sprinkling of freshly ground pepper and 1 tsp of garam masala. Put in the oven and bake for 20 minutes. In the meantime, add the puy lentils to a pan, cover with boiling water and cook on a medium heat for 20 minutes. 5 minutes before the lentils and fish have finished cooking, heat a couple of glugs of olive oil in a medium skillet / frying pan with the remaining 2 tsp of garam masala and smoked paprika. Add the spinach and stir until wilted. Drain the lentils and add to the spinach. Stir round until mixed and the lentils are lightly coated in the spices. Add the yoghurt to the lentils and stir further to combine. Plate up the lentils and spinach mixture and top with a fillet of the cod. Drizzle with more olive oil and a final seasoning of sea salt before serving. Thank you Hunter. Yes, I’ll definitely give your recipe with tomatoes and thyme a try!